The best and most effective way to use the title tag is to not to make the title tag longer than 70 characters. The title should be according to your page; try to use the long phrased keyword within the title tag. Use this tag smartly. Describe your page content and try to use your most competitive keywords in the text. Use no more than 160 characters. We all know that Google stated that this tag does not affect your rankings but there are many SEOs, who still use this tag for other search engines. 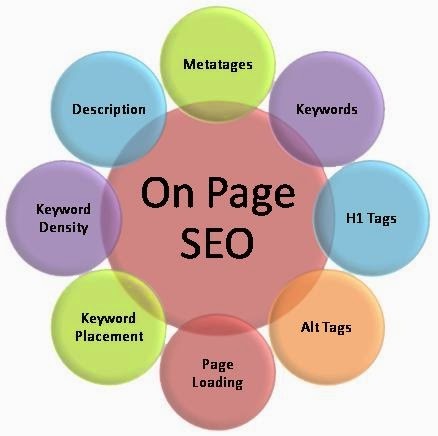 Target your 5 most competitive keywords within the tag. Use H tags with each of your main article headings / sections. Use h1 for the main headings and the rest in h2, h3, h4 and so on. Try use your keywords in the headings and highlight them in the eye of search engines with these HX tags. Optimize each image with ALT and Title tags. Image name can also be optimized; try to use the keywords smartly within the tags as well. Try not to use signs like &, Spaces, ?, etc in your URLs otherwise it can come across as spammy. Ask your developer to make the URLs look easy to read, short and clean. As we all know “Content is King” in the SEO industry, so we can’t ignore this one. Each page should have a minimum of 500 words of great quality content. Create xml sitemap and add each of your website in it. You can submit to sitemap in Google and Bing webmaster tools to make your website index soon. Updated: The robots.txt is a text file webmasters create to instruct robots (typically search engine robots) how to crawl and index pages on their website. Make sure you have added and setup the analytics code so you can properly analyze your website. Add and verify the ownership of your websites via Google Webmaster Tools. These webmaster tools will also help to analyze the on-page validations.